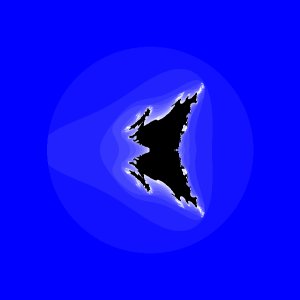 Welcome to Fractal Forums > Community > Meet & Greet > Hi all! Made a few posts here now, so I should probably introduce myself! 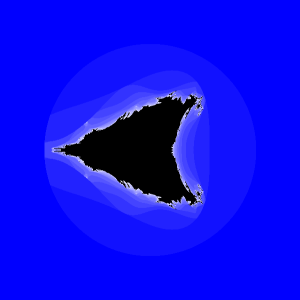 My interest in fractals was rekindled again recently whwn I discovered the ChaosPro program (originally it was on the Amiga). So many fractal types - so little time. 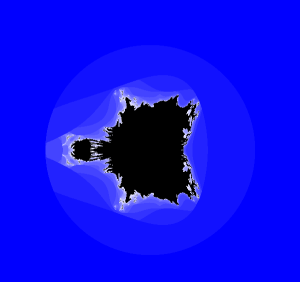 My ambition now is to hunt down the 3D Mandelbrot 'Cave' set with proper bulbs on all axis. To achieve this, I'm experimenting with 'triplex' numbers (a 3D version of complex), and the search for the equivalent 'multiplication function' in spherical geometry. So far, my shots in the dark have produced some semi-promising results, but I occasionally think that I'm looking for something that is as non-existent as the tooth fairy. Still, it's exciting to try! Such a fractal rendered in ray-tracing mode would look absolutely stunning I'm sure. 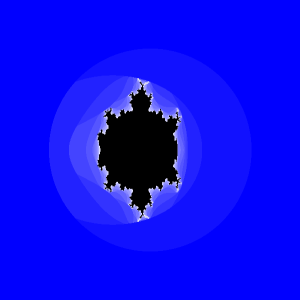 At 29, I have just finished my degree in music and computing, and my interest in maths is probably better desribed as recreational or exploratory rather than academic, but I'm open to studying more about quaternions if it means there's a better chance of finding that Mandelbrot Cave. More info about myself can be found at my website Skytopia.com, though a quick list would include creating optical illusions, rating music/art, music theory, music composition, 3D, science, old-school games, classic game music, piano, and teasing the dog with rocket balloons. 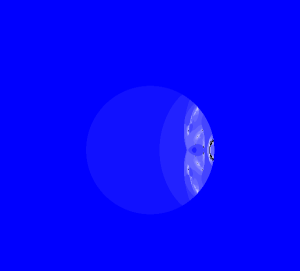 My ambition now is to hunt down the 3D Mandelbrot 'Cave' set with proper bulbs on all axis. To achieve this, I'm experimenting with 'triplex' numbers (a 3D version of complex), and the search for the equivalent 'multiplication function' in spherical geometry. So far, my shots in the dark have produced some semi-promising results, but I occasionally think that I'm looking for something that is as non-existent as the tooth fairy. Still, it's exciting to try! cool, which caley tables are you working with at the moment? any images? as for the "3d mandelbrot set", well, the mandelbrot set is intrinsically 2d, so a 3d fractal it'd have to be something else wouldn't it? Such a fractal rendered in ray-tracing mode would look absolutely stunning I'm sure. that's a really nice page you've got there; the stuff about music is of particular interest to me as i've been putting together knowledge to try and make some procedural sound/music at some stage i've also thought about some of those maths puzzles, and a few of them might be interesting to tackle at some stage... do you have solutions for all of them? Would that be the "Is there such a thing as perfect taste in music?" page? Yeah, the whole area of computer generated music has fascinated me for a while too. Let me hear if you generate anything interesting! Obviously, people have attempted fractal music, but the results from what I've heard don't seem all that good really. Fractal sound effects though; that could easily produce some very interesting results. I've also thought about some of those maths puzzles, and a few of them might be interesting to tackle at some stage... do you have solutions for all of them? Sure thing! You may want to try something from below if it's easy enough, though I'm not sure how interesting they really are (I'll make an detailed animation soon probably). 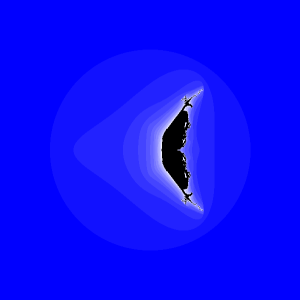 At first I was experimenting with the expanding the basic complex multiplication calc to 3D using various techniques, but now I'm trying a more visual approach. Basically, complex multiplication can be seen as 'rotating' the point around the origin (adding both angles together). Therefore I'm trying to rotate on the X (or Z) and Y axis in 3 dimensions. There are a number of ways of doing this, but for all I know, I could be barking up the wrong tree - it's difficult to say for sure when doing this kind of stuff! Images? Yeah sure. Two of my most 'successful' results include these. 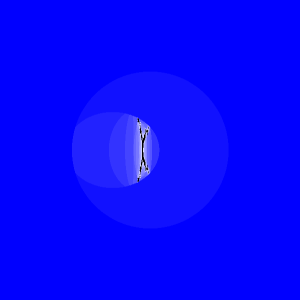 They show cross sections, or slices through an apple, but I might make an animation to show the detail better. 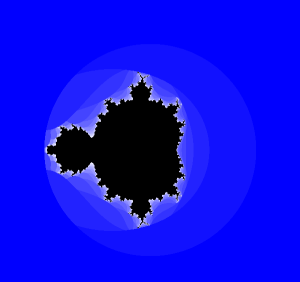 This second one is an improvement, but the Mandelbrot shape is not as clearly defined. The 'bulbs' also seem to 'evolve' throughout the Z axis (grow and then shrink into nothing which is what we're looking for) to a degree, but final judgment of its potential will come once I've made the anim. Well in the same way that the Sierpinski carpet is a 2D version of the 3D Sierpinski sponge, I'm hoping one may generalize the mandelbrot to 3D or to any arbitrary dimension for that matter. 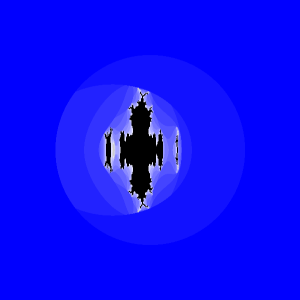 It would still (hopefully) retain the basic Mandelbrot shape characteristics. Greetings, and Welcome to this particular Forum!! Only had a few moments for a quick glance at your site, but will be back for a more thorough viewing.